We appreciate your feedback about your support experience with WooCommerce, developers of WooSlider Products Slideshow. This helps us maintain high standards on the WooMarketplace, and helps WooCommerce improve. Display only “featured” products, if desired. Display only “in stock” products, if desired. Place the slideshow anywhere in the content of your pages or blog posts. Multiple content layout options, powered by WooSlider. 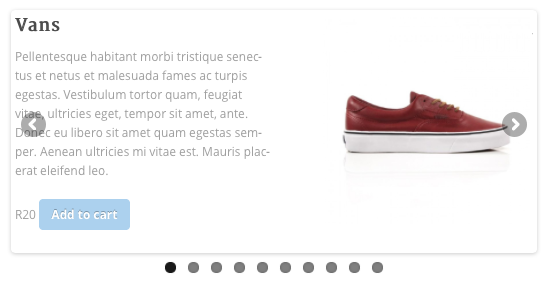 The WooSlider WooCommerce Product Slideshow plugin hooks directly into the WooSlider interface, making slideshow creation a breeze, using the familiar WooSlider interface.